There is something about a lemonade stand that pulls on my heart strings. I was one of those kids who was always looking for ways to make a buck. I did lemonade stands, newspaper routes, and even hauled 2×4’s for my Dad. Safe to assume that I’ve always had an entrepreneurial spirit. But why should kids have all the fun?! I took a childhood classic like Lemonade and gave it an adulthood twist and made Lemonade Mimosas. 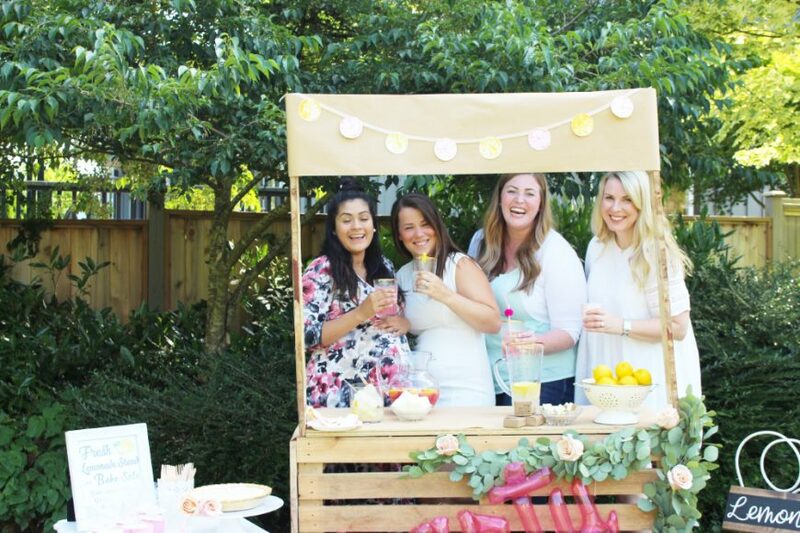 A few of us ladies came together over a common love for this childish theme and give it a twist. Like every black sheep, someone has to “spike the punch” and that black sheep is usually me! My friends at Evolve Cellar sent me their lovely Elan Effervescence. 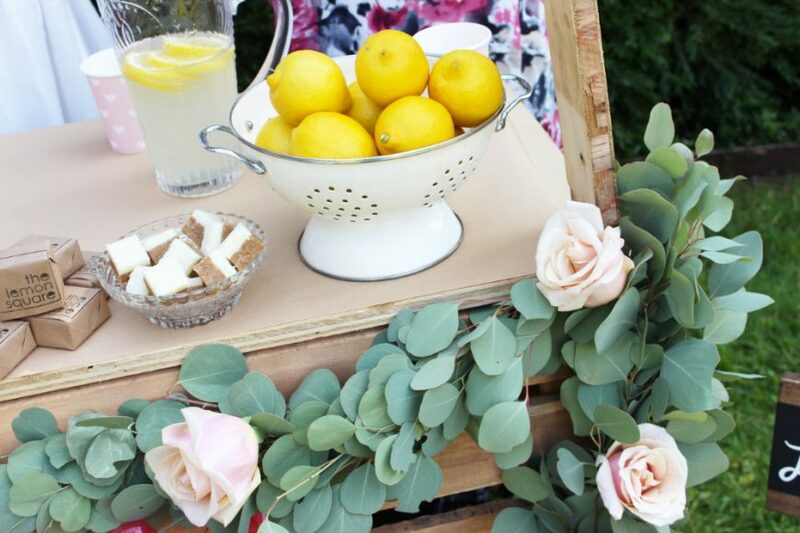 This spruced things up a bit as the Lemonade Mimosa became a real thing! Evolve Cellar is my favourite local wine. Located in the Okanagan, Evolve Cellars support and celebrates the entrepreneurial folks. 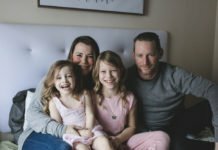 They believe every choice you make has intention – to accomplish, create, and grow. At Evolve Cellars, their intention is to craft friendly and approachable wines. Evolve wines are a celebration of this great region and how we can evolve together. 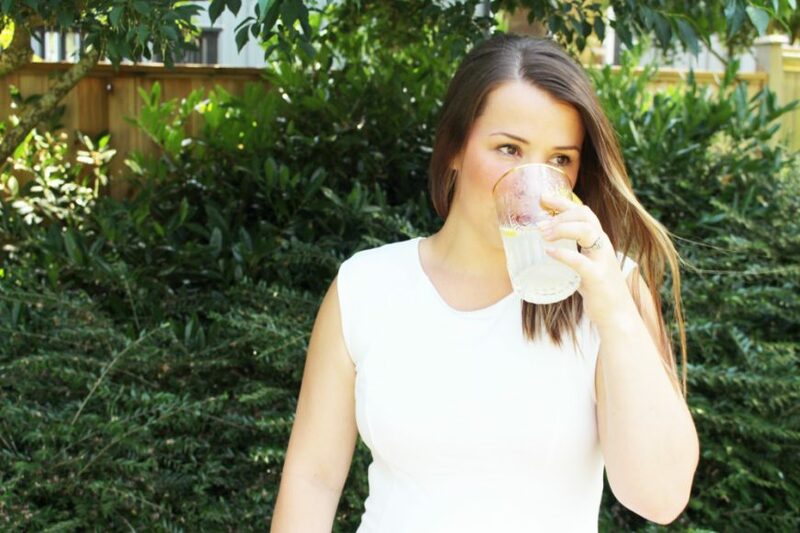 It’s a very simple recipe, as it’s both refreshing and uplifting. 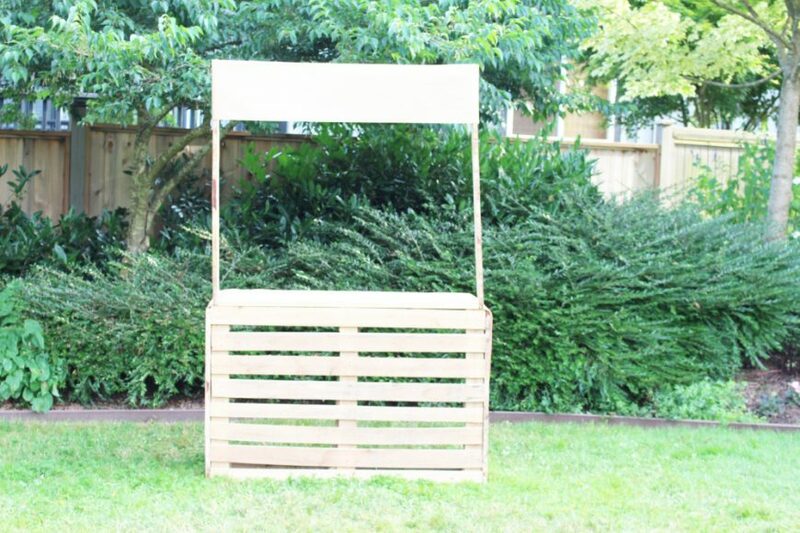 In a very short time, it has become a staple for backyard entertaining. 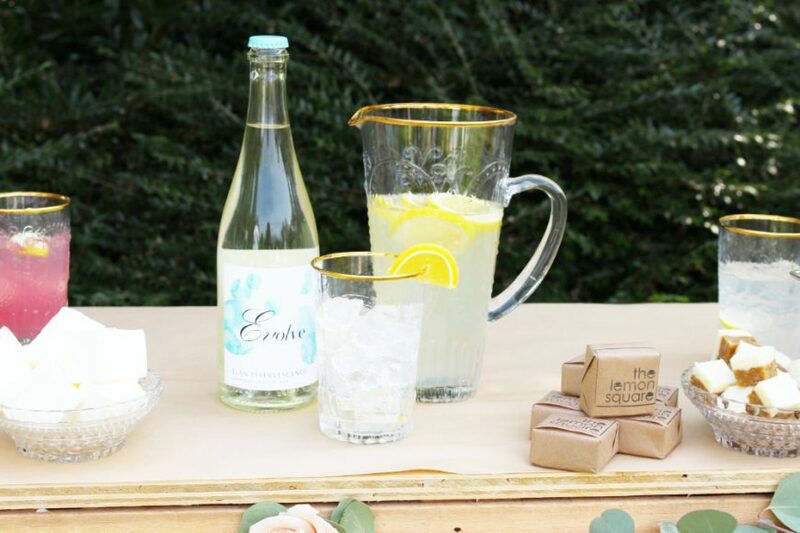 With one full bottle of Elan Effervescence to two cups of your favourite lemonade, this is a real crowd pleaser! I chose to place a Lemon Pizazz Juicy Jelly on the rim as garnish. 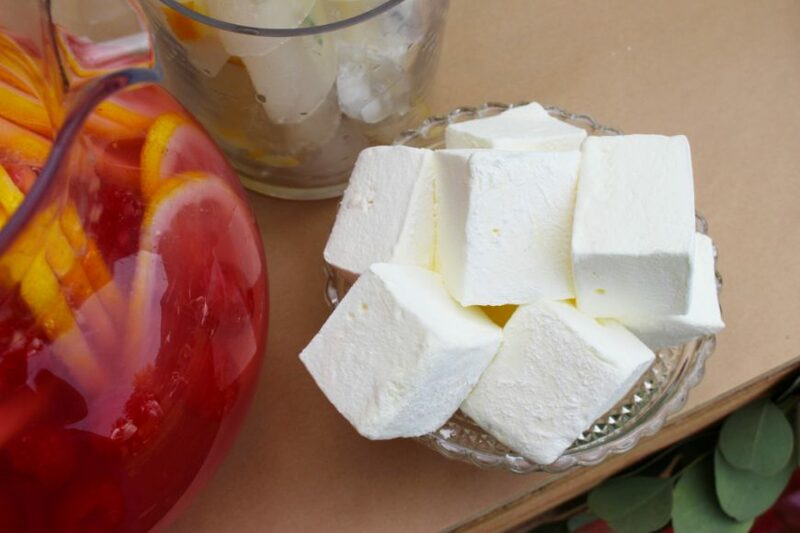 Alternatively, you can really jazz it up with a few fun options such as a sugar rimmed glass. The Juicy Jelly for me brings back many memories of childhood. They were one of those treats that you only got when they went on a sale, and unfortunately, they didn’t go on sale often. Years later, they taste as good as I remember! 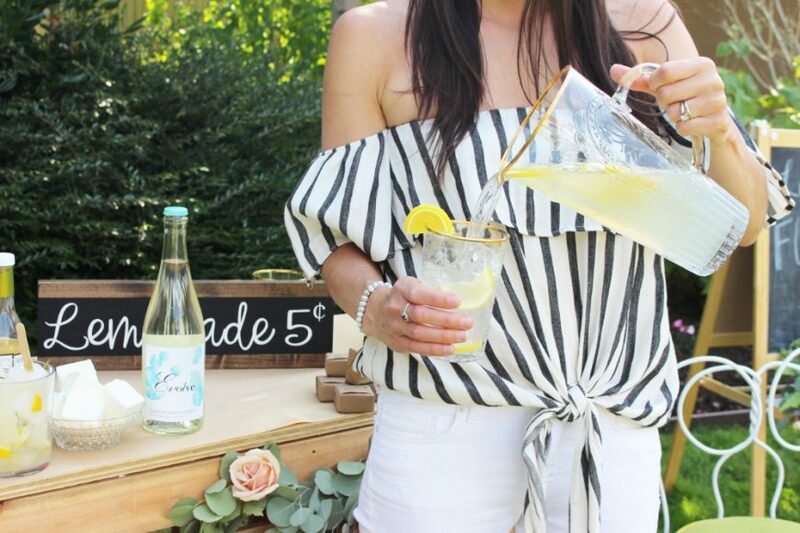 Lemonade stands to me are the ultimate collaboration as adults and as children. 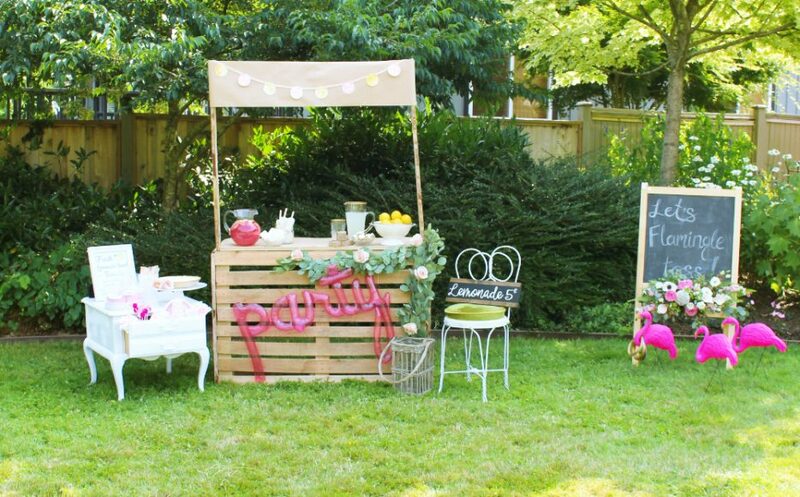 As kids, each person involved was responsible for bringing something to the stand, whether it was cups, ice or the lemonade itself, it was a real joint effort just as this was for us as adults. 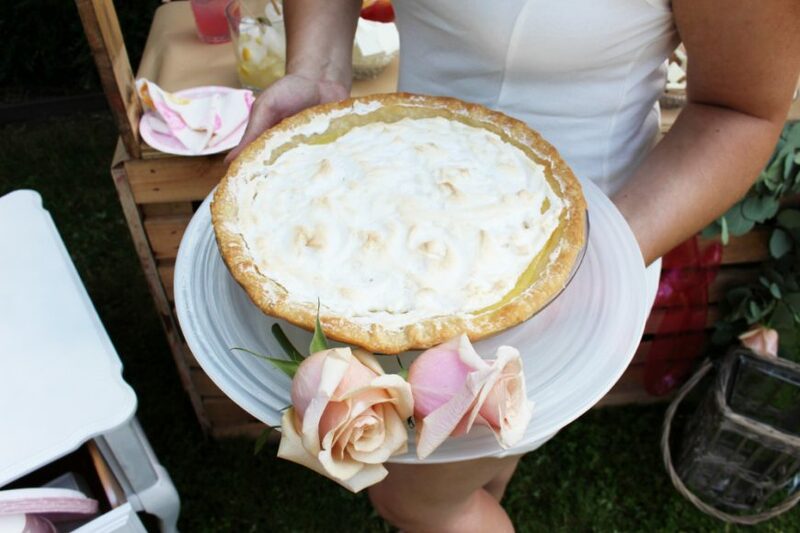 Every blogger brought their own special something to the table and with treats from our favourite local vendors such as Marsh& Mallow and Lemon Square, we ate and drank like Queens. 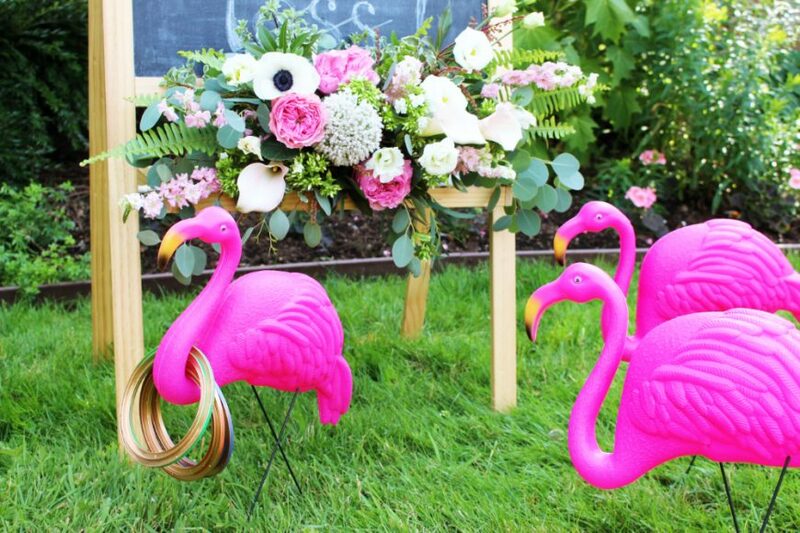 No party is complete without decor and accessories from our lovely friends. 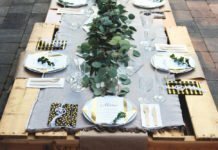 Everything perfectly thought out, we have some of the best Canadian party and decor companies in BC apart of this shoot. Be sure to scroll down to the bottom to see all parties involved! 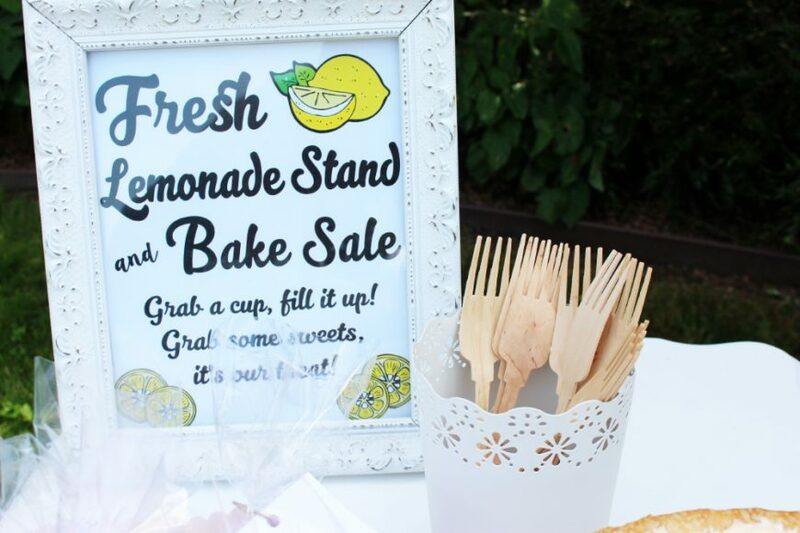 My final contribution to this lemonade stand, was the actual lemonade stand itself. I had a vision of making it out of pallets but upon seeking them out, paranoia and lack of a proper vehicle made this quest a bit difficult. Fortunately, I ended up coming upon a pallet and this weird pallet type chunk of wood, which we will call a pallet for simplicity sake. I kept the pallet as is for the front and then cut the second pallet in half, these pieces were used for the sides. Somehow I managed to have the correct extra pieces to finish it off with a countertop and “poles” going across the top. 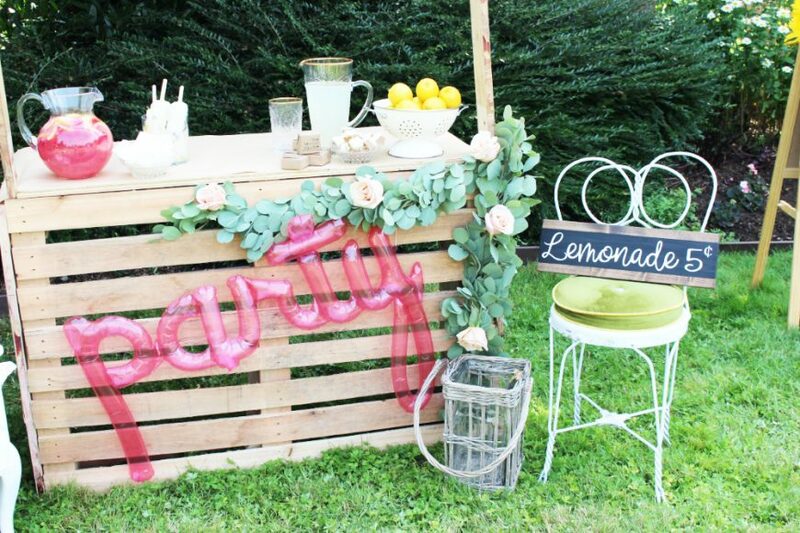 With a little bit of elbow grease, a hammer, and some heavy duty nails, this lemonade stand was born. It was incredibly easy and turned out perfectly, you can find all sorts of tutorials online to make your own or feel free to send me a message as it’s available for rental! We left it’s “woodish” charm as it and couldn’t be more pleased with how it turned out! See below for complete list of vendors involved and links to the other blogger’s posts. Huge massive thank you to all parties involved. 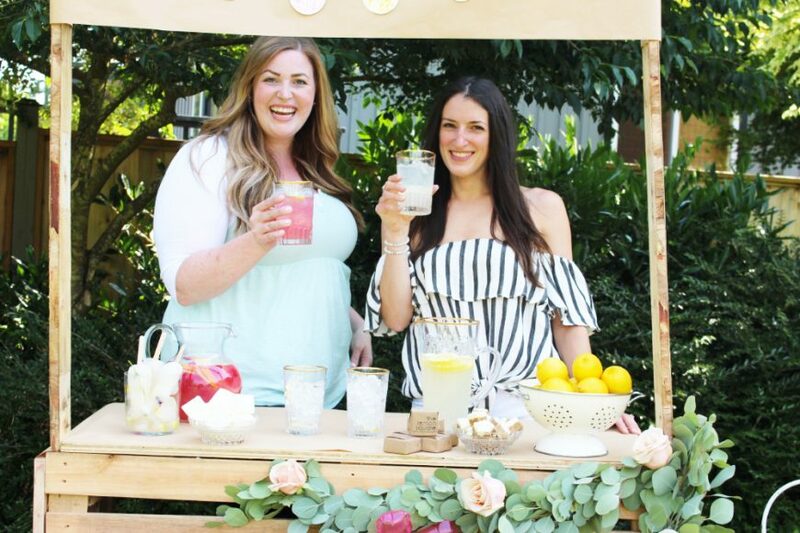 This Lemonade collaboration was exactly what we intended for it to be and 5 bloggers came together as friends to encourage and lift each other up in this fun classic summer theme, which would be perfect for baby showers, birthday parties and so much more! 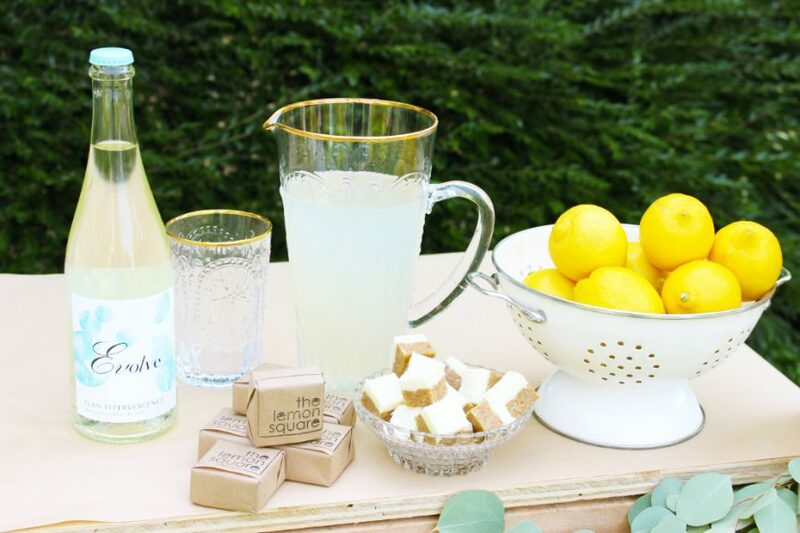 Tamara – Pink Lemonade, Lemon Stamp Bunting, Lemon Stamp Napkins, Lemon Meringue Pie. 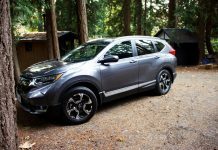 Next articleFamily Secrets To Happy Car Travel With Toddlers! 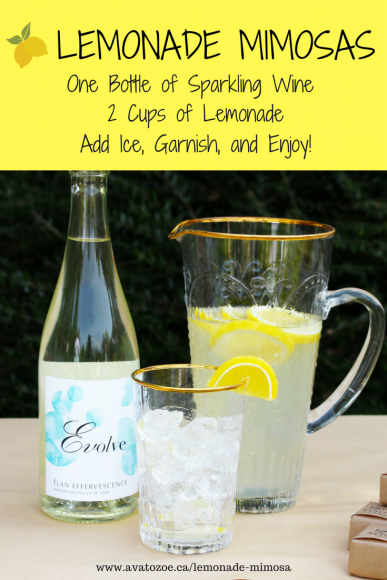 Gimme me all the lemonade !! You and Kat are seriously the perfect duo. Thank you for having me apart of it. Love you to bits ?